How To Improve Internal Linking To Avoid Panda Penalty? With the recent release of the Panda 4.0, the talk is all about Google's algorithm updates and how they effect websites. I recently wrote a short post on how these algorithm updates work, and how are they compared against older ones. Continuing after that, today we shall discuss some strategies to safeguard against any future Pandas. We have covered similar topics in the past as well, but this time, I want to focus on linking, specifically - internal linking techniques you can employ to stay away from a penalty. Google Panda was the first radical change in the search model since many years. And basically, it was aimed at getting rid of low quality websites and bringing higher quality websites in SERPs. Many bloggers saw a drop in their traffic - drastic in some cases - while some also benefited from this update. The impact was negative by far, and this update effected 12% of the total websites when it was first released. The latest Panda, the 4.0, might have had a smaller effect, but still amounts to a big update, and could lead to an even bigger one. 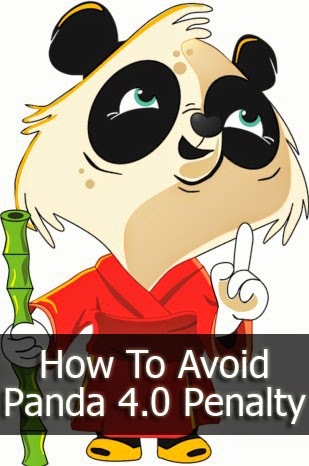 In today's post, I'll explain how building a strong internally linked site structure can help fend off any Panda attacks! Internal linking strategies are widely ignored as a method to increase traffic. But if implemented correctly, it is a great way to increase link equity for your website domain. Your website navigation is the most important in building an inter-linked structure. There are usually two parts of a website's navigation; the main or primary navigation usually on the top, and the secondary navigation, below the primary one, or on the bottom. The main navigation should include the main sections of a site, and sub-sections placed appropriately. Some website owners only have a main nav with just the main sections, and no sub-sections. While this can keep the navigation clean, having sub-sections can help increase site wide internal linking in a safe manner. Try to organize it as best as possible. The secondary nav should showcase links to areas of the site that aren't a normal part of the main sections but could be useful to all visitors. This type of navigation may change depending on the page the user is on. For example if a user is looking at the “Tech” category, the secondary navigation may list popular tech companies, social networks, and so on. Breadcrumbs are a great way to increase internal linking. They're user-friendly, AND help build a better inter-linked structure. Typically breadcrumbs are structured in the same format that the information architecture is designed, but you can change that. I recently wrote an article on how Google treats breadcrumbs, and how best to utilize them. Do give it a read, and follow up on the tips provided, as they can be very helpful. When linking to related content on an article you are increasing the user’s experience and creating links in an organic way. This can help increase conversions through related products, product reviews, forum threads, and so on. If your site uses categories or tags, you can automate this process. This strategy avoids patterns that would normally trigger an algorithm while at the same time funneling link equity to pages that normally wouldn't get links. A typical internal link strategy is to create site wide links that point to a domain’s most popular pages. The problem with this strategy is that often times these pages are too specific to fit into site navigation. As a result the link is typically found in the side bar or footer and is completely irrelevant to the topic of most of the pages that the link falls on. These types of links need to be minimized. While it may seem that you are ignoring these pages, what you are actually doing is making the links to these pages that you keep, count even more.